Canadian airline WestJet is increasing a number of services from Calgary International Airport (YYC) this winter and from 3rd November the popular airline will be heading to another sunshine destination, guaranteed to put a smile on the face of anyone feeling the winter chills. The 2018 North America's Best Low-Cost Airline at the Skytrax awards is starting up a new non-stop twice-weekly service to Sangster International Airport, which if you're unsure where that is, the three-letter IATA code is MBJ. Yep, WestJet are heading to Montego Bay, Jamaica this coming winter season. The new route forms part of WestJet's seasonal schedule for winter 2018/2019, which includes more flights from Calgary to domestic, transborder, international and sun destinations including Maui, Phoenix, Las Vegas, Orlando, Huatulco, Puerto Vallarta and Belize, among others. 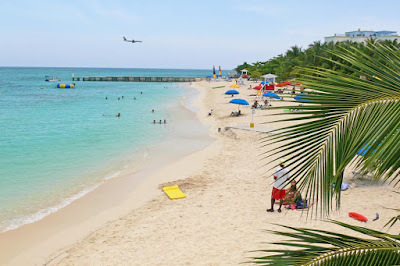 "Flying from YYC Calgary International Airport on WestJet can now get you to the sun in Montego Bay along with 63 other non-stop destinations, more than any other airline out of Calgary," said Tim Croyle, WestJet Interim Executive Vice-President, Commercial. "We know that Calgarians are always eager to escape the unpredictable and long winters and we are confident that this service will be extremely popular. We continue growing our Calgary, Vancouver and Toronto hubs to ensure the best travel experience for Canadians while laying the foundation for the entry of our Boeing 787-9 Dreamliners from these hubs to the world." "WestJet's new non-stop service to Montego Bay is another great travel option for Albertans looking to escape the cold to Jamaica's most lively city and popular sun destination," said Bob Sartor, President and CEO for The Calgary Airport Authority. "We're also extremely pleased with our partner airline's continued growth and investment into YYC as its hub airport, with 142 daily flights out of Calgary during the winter peak." "MBJ welcomes WestJet's twice-weekly service from Calgary, Canada," said Rafael Echevarne, CEO, MBJ Airports Limited. "We congratulate WestJet in expanding their service to Montego Bay from other parts of Canada. We look forward to this service and additional passengers from Canada. Welcome to Montego Bay and Jamaica." *Once weekly effective November 3, 2018 moving to twice weekly, January 6, 2019. Calgary-Nanaimo, from two times daily to three times daily or 21 weekly flights. Calgary-Kamloops, from two times daily to three times daily or 21 weekly flights. Calgary-Kelowna, from seven times daily to nine times daily each business day, or 59 weekly flights – more than any other carrier. Calgary-Fort St. John will double service from once daily to twice daily. Calgary-Grand Prairie, from four times daily to five times daily each business day. Calgary-Yellowknife will double service from once daily to twice daily. Calgary-Regina, from six daily flights to seven daily flights or 49 weekly. Calgary-Saskatoon, from six daily flights to eight daily flights each business day. Calgary-Maui, from four weekly flights to seven weekly flights. Calgary-Phoenix, from 20 to 21 times weekly or three times daily. Calgary-Las Vegas, from 19 to 20 times weekly. Calgary-Orlando, from five to seven times weekly. Calgary-Cancun, from 16 to 20 times weekly. Calgary-Cabo San Lucas, from eight weekly flights to 10 weekly flights. Calgary-Huatulco, from two weekly flights to three weekly flights. Calgary-Mazatlan, from three weekly to four weekly. Calgary-Puerto Vallarta, from 14 to 19 times weekly. Calgary-Ixtapa/Zihuantanejo, from four weekly to five times weekly. Calgary-Belize, from one to two times weekly. Calgary-Nashville seasonal route ending will now be November 26, 2018 and will resume on March 1, 2019. Extension of existing summer service on WestJet Link through the winter between Calgary and Cranbrook, Lethbridge, Medicine Hat, Lloydminster and Prince George.